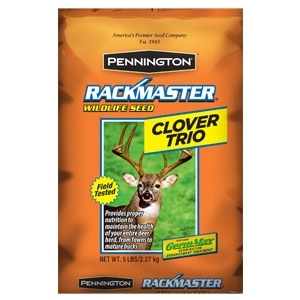 Rackmaster® Clover Trio is ideal for planting a perennial food plot for deer and turkey. This clover blend is a combination of white large leaf (ladino) clovers that will provide high animal nutrition. It is a pre-innoculated seed blend that is widely adapted and should last for up to 5 years if properly maintained. 5 lb. bag covers up to 1/2 acre. Pick up yours today from Chastant Bros.